Based on the last three global championships, Mo Farah will be a huge favourite to defend his title won in an enthralling race in London. He hasn’t lost a race over 25 laps since the 2011 World Championships, when he was caught almost on the line by Ethiopia’s Ibrahim Jeylan and his only other 10,000m loss came on his debut in 2008. Ethiopia and Kenya will each field a very strong trio and the likelihood is the Kenyans will attempt to run as a team as they did in the 2015 World Championships where they at least forced Farah to run 27:01.13 to defeat them. Both Geoffrey Kamworor and Paul Tanui ran him reasonably close in Eugene and Moscow but never really fully threatened. The Ethiopians were very poor at 10,000m in 2015 but will surely raise their game in Olympic year. London runner-up Galen Rupp may well target the Olympic marathon. Finland dominated the first four Olympic finals. Hannes Kolehmainen won the first of these in Stockholm 1912, by more than 45 seconds as only five finished from eleven starters and fifteen qualifiers. In Antwerp in 1920, Paavo Nurmi won his first Olympic gold, outsprinting Joseph Guillemot, who had beaten him in the 5000m. The Frenchman vomited over the Finn’s shoes at the finish. Having just had a large lunch, he was informed the race was being moved from the scheduled 5.30pm to 2.15pm at the request of the Belgian king. Nurmi was prevented from taking part in Paris in 1924 by Finnish officials, who felt he was doing too many events. Finland nevertheless had three of the first four and Ville Ritola won in a world record 30:23.2. Nurmi made his point after the Games by running a world record 30:06.2 that lasted 12 years. He regained his title in 1928 in Amsterdam as he outsprinted Ritola in an Olympic record 30:18.8. That gave him a record ninth and final gold medal. He went on to win a steeplechase and 5000m silver after his 10,000m. Nurmi had planned to run in 1932 in Los Angeles but was declared a professional and banned by the IAAF with a 13-12 vote. Finland nevertheless won two medals but not the gold as Poland’s Janusz Kusocinski had too much finishing speed for Volmari Iso-Hollo. The Pole was executed in 1940 during the war by the Gestapo while working for the anti-Nazi resistance. Finland had won nine medals in the first five Olympics but did even better in Berlin in 1936 as they swept the podium places. European champion Ilmari Salminen won an exciting race by just two tenths of a second from Arvo Askola with Iso-Hollo third. World record-holder Viljo Heino was one of the favourites in London 1948 and expected to keep Finland’s success going but he dropped out when trying to keep pace with Emil Zatopek, who brought the Olympic record inside 30 minutes with 29:59.6 to win by 48 seconds. The London officials weren’t as efficient as Zatopek’s running and were confused by his dominance as the bell was rung a lap too early. They put a number of runners in the wrong positions and awarded sixth place to Belgian’s Martin Stokken, even though he had dropped out before 8000m! The Czech also dominated the 1952 race in Helsinki on the first part of his unprecedented triple gold. He won by 15 seconds, with France’s Alain Mimoun again second as Zatopek reduced his Olympic mark to 29:17.0. Between 1948 and 1954 Zatopek won 38 consecutive races and the next athlete to dominate the event was Vladimir Kuts of the Soviet Union. Kuts reduced the world record to 28:30.4 in September 1956, just prior to the Melbourne Olympics. In Australia he was a big favourite and a 61.2-second opening lap showed his intent. Only Britain’s Gordon Pirie stayed with his seemingly suicidal 14:07.0 halfway time. Kuts’ repeated surges had no effect and almost in despair he let Pirie lead the 20th lap and rested before trying one final effort. This time Pirie folded – so much that he lost 64 seconds in those last few laps and ended up eighth as Kuts won in 28:45.6. The gold was retained by the Soviets in 1960 in Rome as Pyotr Bolotnikov ran a 57.2-second last lap to just miss Kuts’ world record with 28:32.2. By the time of Tokyo 1964, Ron Clarke was world record-holder with 28:15.6. He was favourite in the closing laps when relative unknowns Mohamed Gammoudi and Billy Mills were his only challengers and neither had broken 29 minutes before. On the final lap, Mills looked out of contention when Clarke knocked him sideways to unbox himself, only for Gammoudi to surge ahead. Clarke caught and passed Gammoudi in the straight, but the Tunisian fought back only for both to be run down by a late sprint by Mills, who won in 28:24.4. The 1968 Olympics were controversially awarded to Mexico’s high-altitude capital with the race dominated by Commonwealth champion Naftali Temu and Ethiopia’s Mamo Wolde, with Temu narrowly winning. Clarke, who had reduced the world record to 27:39.4 with no one else close to breaking 28 minutes, suffered in the altitude and struggled home sixth and collapsed unconscious for 10 minutes. A few years later Zatopek gave a visiting Clarke a wrapped package, which he later found contained his 1952 10,000m gold medal. Gammoudi finished third and in Munich 1972 was in contention at halfway when he fell heavily along with Lasse Viren. Viren got up and then took control in the final 600 metres. His last two laps were an astonishing (at the time) 60.0 and 56.4 and that speed brought him a world record 27:38.4, a second up on Emiel Puttemans. Viren easily retained his title in Montreal in 1976, with Portugal’s Carlos Lopes his only challenger in the closing laps. Viren tried to win a third 10,000m gold in Moscow in 1980 and led into the last lap but didn’t have the same speed and faded to fifth. Gold went to the 1972 bronze medallist Miruts Yifter who ran a scorching 26.8-second final 200m. Finland still took a medal as the previously little-known Kaarlo Maaninka caused a surprise in second place. He later admitted to blood doping – as did the 1984 winner Alberto Cova. The Italian’s 13:27.71 second half proved too much for Finland’s Martti Vainio, who lost his silver medal when he failed a drugs test. Morocco had never won a 10,000m medal until they took the first of two successive golds in 1988. Brahim Boutayeb won in Seoul 1988 in an Olympic record 27:21.46 and then Khalid Skah won in more controversial circumstances in Barcelona in 1992. When the clear leading pair, Richard Chelimo and Skah lapped Moroccan Hammou Boutayeb, he then burst back to life, cutting across Chelimo and trying to slow the pace to disrupt the Kenyan’s rhythm over the closing laps. As the crowd loudly booed Boutayeb’s tactics, he continued until dropping out as Skah sprinted to victory with a 26.0 last 200 metres. The crowd and officials thought the two Moroccans had conspired to prevent a Kenyan win and Skah was booed on his victory lap and then disqualified. However, the Moroccans won the appeal and Skah was reinstated. Skah was only seventh in 1996 where Haile Gebrselassie won the first of his two golds – see “most memorable” below. Ethiopia won their third and fourth successive titles in 2004 and 2008. Gebrselassie could only finish fifth in Athens in 2004 but his nation gained a one-two with world record-holder Kenenisa Bekele scorching a 53.0 last lap to easily beat Sileshi Sihine. It was the same one-two in Beijing with a 53.4-second last lap and 2:27.1 final kilometre seeing Bekele retain his title in another Olympic record of 27:01.17. Gebrselassie finished sixth in his Olympic finale. Four-time world champion Bekele returned in London in 2012 but finished fourth as his brother Tariku gained the bronze – see “British successes” below. James Wilson won Britain’s first medal, a bronze in 1920, having led the great Paavo Nurmi for much of the race. James Hatton finished fifth and that position was matched by Ernest Harper in 1924, Arthur Muggridge in 1928 and James Burns in 1936. Stan Cox and Jim Peters finished seventh and eighth in 1948 and Pirie and Fred Norris emulated that in 1952, with Frank Sando fifth. Pirie was second most of the race in 1956 but ended up eighth. Another eighth went to John Merriman in 1960 and then Ron Hill was an excellent seventh in Mexico’s altitude in 1968. European record-holder Dave Bedford led for much of the 1972 race but eventually faded to sixth. Britain had three in eight for the second time in 1976 with Brendan Foster taking the bronze despite stomach problems, with Tony Simmons fourth and Bernie Ford eighth. GB had their then best ever result in 1984 when a far-from-best Mike McLeod was upgraded to silver after Vainio’s disqualification. Karl Keska’s eighth place in 2000 was the best British placing between 1988 and 2008. 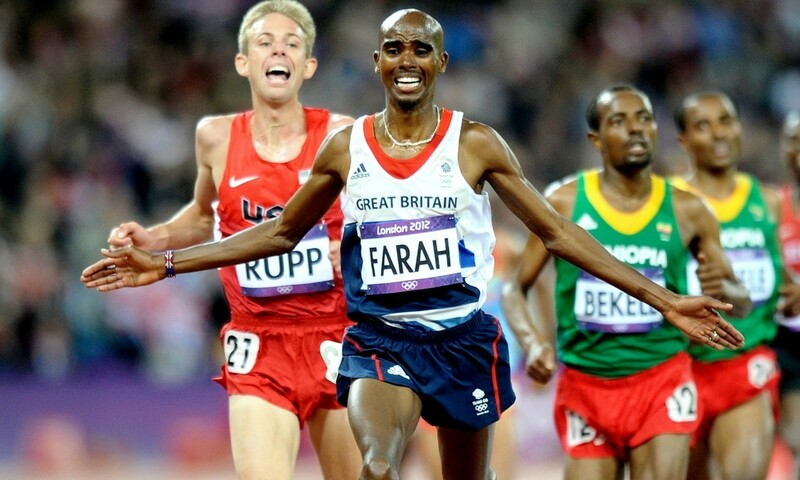 That all changed in 2012 in front of an adoring and excited London crowd when Farah controlled the 53.48-second final lap to fairly comfortably beat training partner Galen Rupp, winning in 27:30.42, having run 2:28.46 for the last kilometre. Following Jessica Ennis and Greg Rutherford’s successes in the heptathlon and long jump respectively earlier on that same day, it proved to be Britain’s third gold on what came to be known as ‘Super Saturday’. In 1996 in Atlanta, Haile Gebrselassie held on to world cross-country champion’s Paul Tergat’s very fast last five laps and his 13:11.4 second half would have won all bar one of the previous 18 5000m titles. The pair returned to battle in Sydney, though the Ethiopian was known not to be quite as fit after missing three months of training with an Achilles injury. Tergat was more patient this time and surprisingly made no move as five runners ran together in the final kilometre and last lap – three Kenyans and two Ethiopians. Tergat was boxed in down the back straight by the Ethiopian Assefa Mezegebu and had to slow down. He swung sideways and with 250 metres left went into a full sprint. Striding out faster than ever before, the Kenyan rounded the bend at a tremendous pace with Gebrselassie in full pursuit but a stride down on the outside. Tergat had finished behind the little Ethiopian in three previous World Championships as well as Atlanta but he had never been ahead like this before. Fifty metres out, Gebrselassie got up to Tergat’s shoulder but couldn’t get past as Tergat continued at full speed. In the last few metres, the Ethiopian inched past and his dip gave him the gold medal by nine hundredths of a second. Briton Karl Keska was an excellent eighth in a PB 27:44.09.